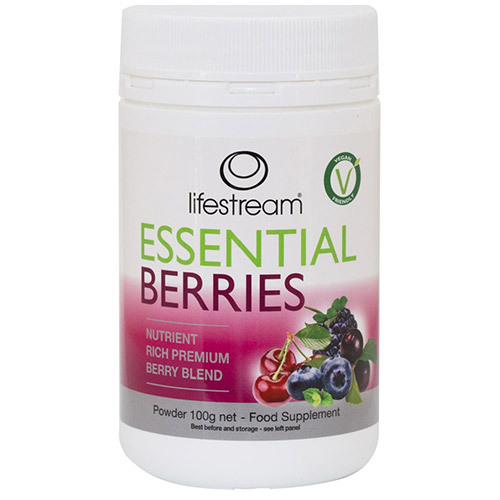 Lifestream Essential Berries is a unique wholefood blend of 7 nutrient-dense berries, including the South American super berry Acai. It is bursting with vitamins and minerals and is naturally rich in nutrients. This exclusive blend of health promoting berries includes Acai, Noni, Pomegranate, Cherry, Blackberry, Blueberry and Raspberry. These berries contain a wide range of natural vitamins, minerals and unique berry phytonutrients such as anthocyanin’s, which provide anti-oxidative stress activity to help protect cells from the damage caused by free radicals. 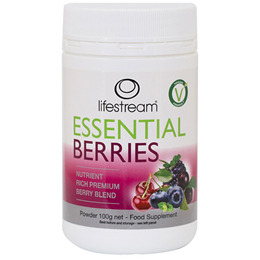 Lifestream Essential Berries has been independently verified to provide an ‘ORAC’ value per serving. ORAC (Oxygen Radical Absorption Capacity) is the scientific measurement of anti-oxidative stress capacity in food. Free from wheat, gluten, milk derivatives, nuts, yeast, added sugar, artificial colours, binders, synthetics or artificial preservatives, the powder is 100% vegetarian and vegan and free from all artificial additives. Acai, Noni, Pomegranate, Blackberry, Blueberry, Cherry, Raspberry, maltodextrin, silica dioxide (anti-caking agents). Adults and Children 12+: 3g daily. Children 6-12 years: 1.5g daily. Add to water or juice, or sprinkle over food. Below are reviews of Lifestream Essential Berries Powder - 100g by bodykind customers. If you have tried this product we'd love to hear what you think so please leave a review.